Kiev or Kyiv is the capital and the largest city of Ukraine, located in the north central part of the country on the Dnieper River. The population in July 2013 was 2,847,200 (though higher estimated numbers have been cited in the press), making Kiev the 8th largest city in Europe. Kiev Polytechnic Institute”, and the Kyiv-Mohyla Academy. Of these, the Mohyla Academy is the oldest outright, having been founded as a theological school in 1632, however the Shevchenko University, which was founded in 1834, is the oldest in continuous operation. The total number of institutions of higher education in Kiev currently approaches 200, allowing young people to pursue almost any line of study. While education traditionally remains largely in the hands of the state there are several accredited private institutions in the city. Modern Kiev is a mix of the old (Kiev preserved about 70 percent of more than 1,000 buildings built during 1907–1914) and the new, seen in everything from the architecture to the stores and to the people themselves. When the capital of the Ukrainian SSR was moved from Kharkiv to Kiev many new buildings were commissioned to give the city “the gloss and polish of a capital”. In the discussions centered on how to create a showcase city center the current city center of Khreshchatyk and Maidan Nezalezhnosti (Independence Square) were not the obvious choices. Some of the early, ultimately not materialised, ideas included a part of Pechersk, Lypky, European Square and Mykhailivska Square. The plans of building massive monuments (of Vladimir Lenin and Joseph Stalin) were also abandoned; due to lack of money (in the 1930s–1950s) and because of Kiev’s hilly landscape. Experiencing rapid population growth between the 1970s and the mid-1990s, the city has continued its consistent growth after the turn of the millennium. As a result, Kiev’s central districts provide a dotted contrast of new, modern buildings among the pale yellows, blues and greys of older apartments. Urban sprawl has gradually reduced, while population densities of suburbs has increased. The most expensive properties are located in the Pechersk, and Khreshchatyk areas. It is also prestigious to own a property in newly constructed buildings in the Kharkivskyi Raion or Obolon along the Dnieper. Kiev’s most famous historical architecture complexes are the St. Sophia Cathedral and the Kiev Pechersk Lavra (Monastery of the Caves), which are recognized by UNESCO as a World Heritage Site. Noteworthy historical architectural landmarks also include the Mariyinsky Palace (designed and constructed from 1745 to 1752, then reconstructed in 1870), several Orthodox churches such as St. Michael’s Cathedral, St. Andrew’s, St. Vladimir’s, the reconstructed Golden Gate and others. Among Kiev’s best-known monuments are Mikhail Mikeshin’s statue of Bohdan Khmelnytsky astride his horse located near St. Sophia Cathedral, the venerated Vladimir the Great (St. Vladimir), the baptizer of Rus’, overlooking the river above Podil, the monument to Kyi, Schek and Khoryv and Lybid, the legendary founders of the city located at the Dnieper embankment. On Independence Square in the city centre, two monuments elevate two of the city protectors; the historic protector of Kiev Michael Archangel atop a reconstruction of one of the old city’s gates and a modern invention, the goddess-protector Berehynia atop a tall column. Official figures show that between 2004 and 2008 Kiev’s economy outstripped the rest of the country’s, growing by an annual average of 11.5%. Following the global financial crisis that began in 2007, Kiev’s economy suffered a severe setback in 2009 with gross regional product contracting by 13.5% in real terms. Although a record high, the decline in activity was 1.6 percentage points smaller than that for the country as a whole. The economy in Kiev, as in the rest of Ukraine, recovered somewhat in 2010 and 2011. Kiev is a middle-income city, with prices currently comparable to many mid-size American cities (i.e., considerably lower than Western Europe); and despite the poverty of the rest of the country, and large tracts of Soviet apartment blocks, has a notable lack of slums. 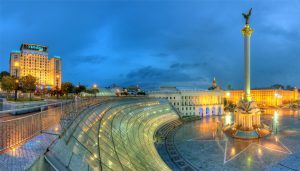 Kiev is the undisputed center of business and commerce of Ukraine and home to the country’s largest companies, such as Naftogaz Ukrainy, Energorynok and Kyivstar. In 2010 the city accounted for 18% of national retail sales and 24% of all construction activity. Indeed, real estate is one of the major forces in Kiev’s economy. Average prices of apartments are the highest in the country and among the highest in eastern Europe. Kiev also ranks high in terms of commercial real estate for it is here where the country’s tallest office buildings (such as Gulliver and Parus) and some of Ukraine’s biggest shopping malls (such as Dream Town and Ocean Plaza) are located. Kiev is home to many of Ukraine’s largest businesses. Trolleybus ElektroLAZ-301 at Sofia Square. The publicly owned and operated Kiev Metro is the fastest, the most convenient and affordable network that covers most, but not all, of the city. The Metro is continuously expanding towards the city limits to meet growing demand, currently having three lines with a total length of 66.1 kilometres (41.1 miles) and 51 stations (some of which are renowned architectural landmarks). The Metro carries around 1.422 million passengers daily accounting for 38% of the Kiev’s public transport load. In 2011, the total number of trips exceeded 519 million. The historic tram system, once a well maintained and widely used method of transport, is now gradually being phased out in favor of buses and trolleybuses. The Novo-Darnytskyi Bridge over the Dnieper river. Kiev represents the focal point of Ukraine’s “national roads” system, thus linked by road to all cities of the country. European routes Tabliczka E40.svg, Tabliczka E95.svg and Tabliczka E101.svg cross Kiev. Railways are Kiev’s main mode of intracity and suburban transportation. The city has a developed railroad infrastructure including a long-distance passenger station, 6 cargo stations, depots, and repairing facilities. However, this system still fails to meet the demand for passenger service. Particularly, the Kiev Passenger Railway Station is the city’s only long-distance passenger terminal (vokzal). In 2011 the Kiev city administration established a new ‘Urban Train’ for Kiev. This service runs at standard 4-10-minute intervals throughout the day and follows a circular route around the city centre, which allows it to serve many of Kiev’s inner suburbs. Interchanges between the Kiev Metro and Fast Tram exist at many of the urban train’s station stops. Suburban ‘Elektrichka’ trains are serviced by the publicly owned Ukrainian Railways. The suburban train service is fast, and unbeatably safe in terms of traffic accidents. But the trains are not reliable, as they may fall significantly behind schedule, may not be safe in terms of crime, and the elektrichka cars are poorly maintained and are overcrowded in rush hours.